HERE at last is the definitive Lovecraft—the third in a three-volume set of the collected macabre fiction that embodies the author’s own final thoughts and stylistic preferences. Based upon S.T. Joshi’s extensive and painstaking collation of extant manuscript materials, this new Lovecraft edition from Arkham House is the only completely authoritative text and supersedes all previous editions. All the remaining fiction by H.P. Lovecraft is collected in this final volume, which includes every type of imaginative story in which the author excelled—Dunsanian fantasies, Gothic horror, and tales of the Cthulhu Mythos. Though secondary to the remarkable fiction preserved in The Dunwich Horror and At the Mountains of Madness, these early works constitute absorbing testimony to Lovecraft’s creative development. Completing this volume is the only critical recension of “Supernatural Horror in Literature,” the single most significant essay on the horror genre. In the whole range of fantastic literature, Lovecraft created a new form that is neither pure fancy nor pure science fiction. He combined a factual and accurate scientific knowledge with its extension to the absolute limit in supernatural bizarrerie. His work defies classification, for it is as much myth as reality—both lore and legend at their haunting, haunted best, and at the same time science at its most provocative. His tales have been termed the finest weird fantasy ever written, and yet also the most superbly literate science fiction. Lovecraft’s work has achieved an honored eminence among the great visionary fiction of the ages precisely because, while betraying no trace of the commonplace, his stories are based convincingly in the world of everyday reality, yet lure the mind into the farthest reaches of the imagination, the star-flung spaces of the universe, the cosmic realm of a master mythmaker. 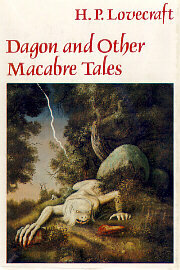 Dagon and Other Macabre Tales. By H.P. Lovecraft, Selected by August Derleth, With Texts Edited by S.T. Joshi, and an Introduction by T.E.D. Klein. Sauk City, WI: Arkham House Publishers, Inc.; 1987; ISBN 0-87054-039-4; Hardcover.